With no prior experience, you can soar the skies of southwest Montana with a professional U.S.H.G.A. certified tandem instructor. Favorable conditions make it possible to maneuver the glider into rising columns of air to gain altitude and extended flight times, which expose you to incredible views that make your flight an unforgettable experience. 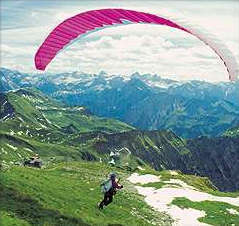 During a tandem flight, the passenger is seated comfortably in a harness that is connected securely to the pilot. With a short run, the pilot and passenger are gently lifted off of the hillside into the skies above. Landings are slow and easy and involve a gentle run on touchdown.